[AUTO](VC):When placed, COST [Counter Blast (1) & Soul Blast (1)], choose two of your units, search your deck for up to one card with the same card name as each of those units, call them to separate (RC), and shuffle your deck. 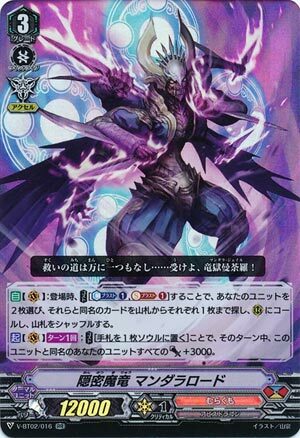 [ACT](VC)[1/Turn]:COST [Put a card into your soul from your hand], and all of your units with the same card name as this unit get [Power]+3000 until end of turn. Congratulations, Mandala Lord. You are Golden Beast Tamer except ACT, so no attack extension for you, you don’t power up any front row unconditionally, and you’re limited to the units that are there when the skill goes off unlike GBT. …well, he’s an okay first ride if you’re going first because ZANBAKU is vanilla otherwise until Grade 3? Otherwise MUSASHI suits your needs better and doesn’t force you to run sucky Grade 2s to work, unlike this thing.